Alpha is a clean, simple and fast loading blogger template, It is highly customizable and has responsive layout so that it can fit into any screen size. You can use this template for any niche like tech, Blogging, Events, Authority, Blogging Resources, News, Latest Trends etc. 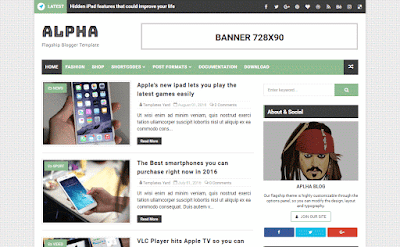 Alpha is equipped with various of widgets which will help you to publish your blog more professionally. To make it easy for you we have published this detailed documentation, so that you can setup your blog correctly. You have made a good decision by choosing our template. You can check the live demo or download the template through the button below and also Please Read this documentation carefully in order to set up your blog and please note that there’s no support for free users. This widget automatically picks recent posts from you blog. Just Make your blog feed full make your blog public and add at least one label to every post. To change the feedburner username of subscription box, follow below steps. Change the highlighted text with your id with your own. Change the value of var postperpage= 7; to any number you want. how to create ads on middle article? Why height 0px is on element style of an element with id ticker? I tryed to change it by adding element style to override it but didn't work out. It was 45px on demo. tvman99.blogspot.com. Looking forward to get help. Your blog contains zero posts. How will the ticker work?